What we love most about being a footwear blogger is sharing shoes from love from both high and lower end footwear brands. Take today's shoes for instance, they are less than $50.00 a pair. 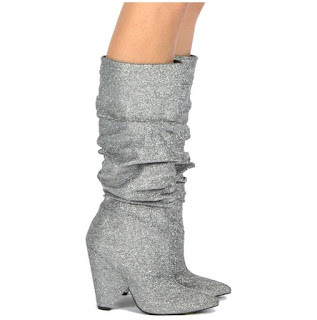 Yes, you read that correctly, these glittery Qupid Wiley-01 Slouchy Boots are a bargain. 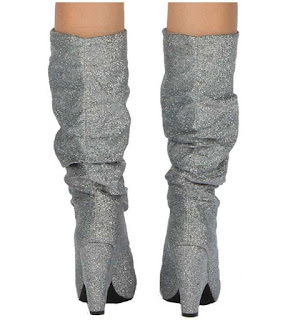 Boasting a slouchy silhouette, a hot trend for the season, these fab calf-high boots features a metallic upper in stretch lurex, a pointed toe, and a 3 1/4" cone heel for stability as well as style. While they also come in black, and red, it is these eye-catching silver color that has captured our undivided attention. Want a pair for yourself? 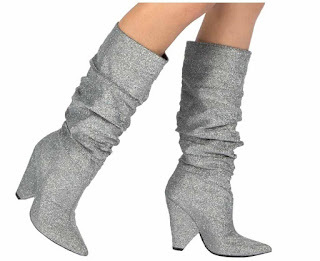 Get them for $47.00 on www.qupid.com.